Abstract. Chinese foreign policy, at the beginning of XXIst century, develops a multitude of complex political concepts, such as harmonious world, the Five Principles of Peaceful Co-existence, New Relations between Great Powers, Peaceful Rise of China and others. The paper explores only some dimensions of two political concepts, such as the New Chinese Security concept and the Peaceful Rise of China, by revealing the contemporary meanings if these concepts and also, by emphasizing their roots within the philosophical ancient visions of the Chinese political tradition. This great emergent power (emergent daguo) has built a strategic view of security, during the past decades, adjusted to what China considers to be a changing international political environment, of multipolar nature. – Abandoning the bipolarity paradigm and the strategy of restricting the rival bloc, developed against America, towards the end of the 20th century (“cold war” mentality) and considered to be obsolete and inadequate to express a new reality, in terms of politics and international security. – NCS alignment to China’s objectives of external policy, acknowledging an evolution, a widening of the content of the “security” concept, from the military and political field, to the economic field, to science, technology, culture, environment and several other fields (China’s Position Paper on the New Security Concept/2002). Thus, the NCS content includes other types of security: classic security (military, political), economic security, social and environmental security, scientific-technological security. – Connecting NCS to the concept launched by Hun Jintao, at the UN General Assembly, the concept of “harmonious world of durable peace and common prosperity”. The concept of “harmonious world” refers to the necessity of the states to cooperate with one another, “in order to build a harmonious environment, in which the countries respect each other, treat each other as equals and are in pursuit of mutually advantageous results, sharing benefits and common prosperity”. This conception of the world is once more a “post-realist conception”, refusing ”the zero sum” game and considering that the security and prosperity of a country cannot be achieved to the disadvantage of another country. 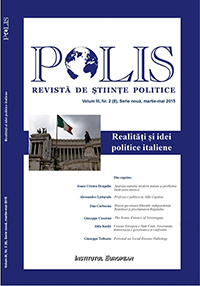 – Connecting NCS to the “shi” concept (no English equivalent), which means “arrangement, layout, strategic advantage and maximization of regular conditions, traditional military tactics which, translated into politics, entail factors such as the power of alliances, the power of a policy of a rival centre of power, political decision”. 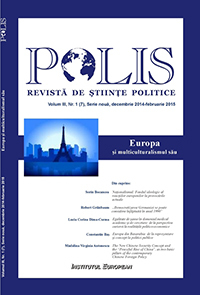 In the context of analysing the NCS content, it would be translated as follows: the need to set an international political environment, favourable for the fulfilment of political objectives; support granted to the security mechanisms based on cooperation, created starting from NCS; development of strong political and economic relations, at global level. – A holistic meaning of the “security” concept, at the beginning of the 21st century, based on six tendencies of the external and security policy of China: “No War Between the Large Powers”; (involvement in) Globalization; the United States as a Partner and Competitor (not as Rival); Unconventional Security Challenges; Rise of China. – Connecting NCS to a multipolar word, seen as a “world of diversity, especially for the Asia-Pacific region, based on mutual harmonization, mutual learning and on great cooperation”. A concept of cooperation in the field of security, applicable even in terms of cooperation between countries with different methods of development and different visions. – Connection between NCS, the concept of “traditional comprehensive power” and the Chinese traditional strategic thinking (Taoism and Confucianism): the concept of yin//yang, considered in Confucianism to be the root of all things, complementary forces, where Yin is the passive element, fertilizing, moist (the military and political strategic doctrine considers that it facilitates the NCS elements based on mutual respect and benefit). The Yang element (Masculine) is considered to be the active and creative one; connected to NCS, it is regarded as supporting the cooperation among states, to counter non-conventional threats, promoter of confidence among states, promoter of peace, prosperity and social progress. At the same time, the security doctrine considers that flexibility is the most important element of NCS, allowing an adjustment to the changes in the international environment, as the water flow avoids obstacles and changes relief. – NCS connection to Sun Zi’s concepts, i.e. “zheng” (regularity, rigidness) and “qi” (fluidity, deviation from, variation, modification), where NCS is translated by the elements of resistance to the “cold war” mentality and by the new approach on security, based on win-win cooperation and common interests. – NCS connection to the Confucianism concepts of “wen” (civility, peaceful spirit) and “wu” (martial nature, belligerent spirit), in which the doctrine notices a dominance of “wen” over “wu” (diplomacy over the military threat). The “wu” element is used only in case the “wen” element (diplomacy) fails; thus the outline of a strategic thinking pattern of great importance for NCS, used by China (“to excel through strength of spirit, rather than through the force of weapons”). 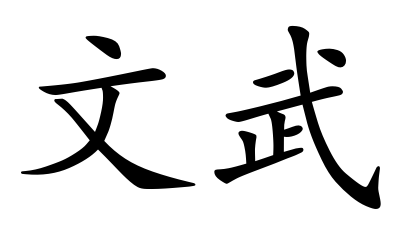 Chinese symbols for «wen» (first from the left), referring to the academic environment and civilian matters, and for «wu» (referring to military matters and martial arts). “Wen” (cultural element) is the foundation (ti) and “wu”(martial element) is the application (yong). Reaching the cultural level is based on the martial element. To be able to analyse correctly and in its full complexity a concept which is fundamental for the current external policy developed by China as a regional power pole and, as a part of the doctrine considers, even as a global power pole, i.e. the concept of “Peaceful Assertion/Rising of China”, it is necessary to have a look at the history of key political and diplomatic concepts of China. Thus, we consider that it is necessary to recall the historic importance of the Chaogong system, for the assertion of China as an empire and for its consolidation as political entity. Dating back to the era of the Shang dynasty, between the 13th and 11th century, B.C., this proto-system developed in China’s relations with the nomad populations was based on a set of relations designed to maintain peace and stability at the borders of the territory controlled by the dynasty. Later on, the Chaogong system was recognized officially in the 2nd century B.C. and practiced until the 9th century (the moment of clash with the civilizations of large European powers, based on other values and manners of relating to cultures and civilizations different from theirs). The territories over which the Chinese emperors ruled were regarded (by them) as a pillar of civilization, spreading the imperial values and civilization to other peoples and tribes, “a point of attraction for those who wanted to emancipate” (therefore, we can discuss about a system that is a typical form ofsoft-power or of imperial civilizing power, in the peaceful sense, that of peaceful consolidation of cooperation and contacts with other tribes and peoples). The emperors of China considered themselves keepers of unique and unequalled cultural traditions and civilizational values, which justified a political position of “spreaders of civilizations”, not “borrowers of civilization”, (aspects and attitudes which are very important for properly understanding the nature and functioning of the Chaogong system and, later on, China’s concept of “Peaceful Rise”). The main purpose of this system would be to sustain a “harmonious world”, inside and at the borders of the Chinese empire, objective which could not be fulfilled using an aggressive, military-based conception of occupation and brutal imposing of the Chinese civilization; on the contrary, by constantly practicing relations based on respect, but also on the attraction exercised by the empire, as a world of civilization and order, on the world beyond its borders. The idea of the empire as a “pillar of civilization” is of particular importance for the construction of a type of non-aggressive empire, based on soft power, on attracting the outskirts, not their armed conquering. As “holders of unique, unequalled material and spiritual values”, the emperors of china considered that they were in a position in which they did not need anything from other peoples and tribes. The vision of peaceful empire, spreading the rays of its grand civilization, without the force of weapons, without aiming at achieving military supremacy over other peoples, having instead the objective of obtaining peace, harmony with the surrounding world, defined in its millenary history both this space of civilization and its political constructions (the type of empire). The emperors of China considered that the “harmonious society” (seen here as a political state of peaceful coexistence among different peoples and tribes) can only be based on “relations of peace, cooperation, respect of the peoples and tribes for the imperial institution of the Chinese emperor and also on China’s respect for these peoples” (imperial attitude which excluded involvement in their internal affairs and imposing by force the Chinese culture and language). The Chaogong system stemmed from the idea of China sharing its political and cultural values with others (for example, cultivating the virtuosity of government officials, meritocratic systems, the “well-governed state”, based on ethical regulations and self-improvement of the individual, of the standards of morality and education, both for the people governing China and for the peoples with which China came into contact, standards which, once met by the both parties, led to avoiding conflicts, rebellions caused by the lack of education and morality – i.e. by barbarism – at the borders of the empire). The Chaogong system found its basis in another fundamental principle of the Chinese traditional political thinking, which is also seen in today’s concepts of external policy, applied by China, at the beginning of the 21st century: the principle in question is yi shi tong ren (treat everyone with the same generosity), starting from the concept of peaceful opening of the Chinese imperial civilization, through knowledge and respect, in relation with the peoples and tribes at their borders and not only. This system was interpreted in a limited, distorted manner (as compared to the philosophy of peaceful assertion, through the force of civilization, not by force of weapons, applied by China during its history), by the Occidental powers, with which China came into contact, at one point, in history; it was interpreted as a “tributary system”, in which the peoples accepting it had to present their pledges to the emperors of China, regularly (with certain objects, called gong). Their value and quantity were determined by thesepeoples; therefore it was not a tribute in the true sense of the word, i.e. financial burdens and goods creating a relation of systematic economic exploitation, for the use of the metropolis or the empire; on the contrary, derived from the idea that the empire of China did not need anything in relation with other peoples and tribes, the gifts given by the emperor to the countries in the Chaogong system were very expensive, burdening excessively the treasury of the empire, in certain periods. The gifts offered by the ambassadors of these peoples that accepted the Chaogong system, as homage, were exceeded by far by the gifts offered by the Chinese officials, both in terms of quantity and in terms of value. The more a relation of peace and stability at the border with a certain people was perceived by China as being important for the peace and stability of the empire, the greater were the gifts offered by the Chinese emperor to the respective people, which attracted other peoples and tribes in the region, towards a good political relation, in the Chaogong system, with the empire of China (soft power policy). Thus, this system was meant to ensure the consolidation of the empire, by practicing certain peace relations with other peoples and tribes, including regions like Persia, Arabia, India, the states on the coast of Eastern Africa, Japan, states in Central and Western Asia (in the age of glory of the Chinese empire, we can talk about the constant implementation of a soft power imperial policy, extremely different from the manner in which, for example, the large European powers of the moment perceived the international political stage and the relations among the large actors and various civilizations). In order to properly understand China’s external policy, at the beginning of the 21st century (strongly focused on the soft power component, in our opinion), we must also regard it from its historic perspective and neverconsider it to be completely separate from the concepts of Chinese traditional politics, derived especially from Confucianism (the model of the state created on the basis of virtue and etiquette, moderation and kindness, translated as respect for the values of order and peace). During its millenary history, China has built and implemented a type of culture based on ethical values, as a guiding principle, both for the relations inside its society and regarding the relations with other peoples and tribes. According to the specialists, another specific characteristic of the Chinese culture (also used as a trump card in the international political relations, over time) is its extraordinary ability to assimilate other cultures. Even if it was, in certain periods, under occupation of certain nomad peoples, the military supremacy of the nomad peoples provide to be ephemeral, on account of the lack of the cultural support, equivalent as soft power to the Chinese civilization. Thus, the invaders were assimilated and converted in the Chinese culture, not being able to cause its disappearance. Tolerance to other cultures, to other ideas and their integration in its civilization are other characteristics of the Chinese cultures, during the history, deriving from the doctrine debates of the hundred schools of thinking, during the Springs and Autumns (770-476 B.C.) and of the Combating Kingdoms (475-221 B.C. ), as well as during the long coexistence, in the Chinese cultural space, of varied philosophies and religions (Buddhism, Taoism, Confucianism) or as a result of the tolerating acceptance of Christianity and Islamism, as well as of other religions. In addition, China is also defined as a cultural space marked by a harmonious relation (non-conflictual), based on respect for nature. In this sense, the Chinese conception is fundamentally different from the Occidental logic (nature as an objective to be defeated, conquered and transformed; nature as an object that needs to be tamed or exploited without limit, until exhausted; consumerism). The Chinese conception regarding the relationship between man and nature is based on the idea that man, as part of nature, of the terrestrial ecosystem, must always act according to the laws of nature and not against them, not to exceed irrationally and without limits nature’s capacity to bear its manmade transformation or destruction. Man must cooperate with nature, in order to understand it and use it wisely, with moderation, and in order to always provide it with ways of renewal and protection. This attitude is of great importance in the 21st century, when the external policies of the states, especially in relation to the global agenda (climate changes, relation to the environment), but also with large transnational corporations, must reflect more and more responsibility to nature, therefore they must adopt a strong national and global ecological side (derived from the concept of “environment security”, “human security”, “food security”, all being interconnected, and regarding the man-nature relationship). Overall, the Chinese culture is defined through a set of traditional values (emphasis on ethics, on the group interest, on moderation or the middle path, on self-perfecting and on harmony). Especially the concept of “harmony” is one that has strong connotations, at the beginning of the 21st century, in shaping China’s strategic vision of the international political environment. The vision of the multipolar world and of the “harmonious society (international, in this case)”, together with the Five Principles of Peaceful Coexistence are merely rephrased versions of China’s traditional conception of a diverse world, organized harmoniously (it is mandatory that the status-quo is not obtained only based on conflicts among large powers), peacefully, based on the principles of mutual respect, of tolerance, proper behaviour and ethics among the state actors (by extension, in the global world and regarding the non-state actors, such as corporations). Chinese symbol for « harmony ». The ethical element introduced in the international world of the 21st century, due to China’s influence as a global centre of power, in a multipolar world, announces to be of great importance, leading to a consolidation of the relations of cooperation and peace among peoples (and the large powers), to the development of certain common grounds on the global agenda, to the structuring of several global objective that could lead to common policies among “the large powers” (although this term, derived from the realist logic, is not particularly approved in the official speeches delivered by China, as it entails a connotation that reminds of a world based on the logic of rivalry and power policy, rather than a world of the Confucianism and Taoist principles of non-violence). The ethical element, together with the concept of “harmonious (international) society” become important aspects of China’s external policy in the 21st century, leading to the development of certain paths of thinking and international diplomatic action, meant to provide more stability, peace and cooperation for peace, among the nations, at the beginning of the 21st century. By settling differences, harmony (he) is different from uniformity (tong), as it is capable of accepting new things and create new cultural and dialogue forms. For Confucianism, harmony represents the highest principle in the regulation of relations between the governing authority and the governed entities, within the family, within a society, as well as in the relations among tribes and peoples, harmony which is achieved by practicing the middle path, moderation (zhong yong). Nowadays, when applying its conception of external policy (based on the concept of “harmonious world” and on The Five Principles of Peaceful Coexistence), China develops relations of cooperation and partnerships with the USA, Russia, Japan, ASEAN, India, the European Union, the Latin America states, the African Union and the Gulf state, assuming at the same time a key decision-making position, within organizations and groups such as BRICS, the UN Security Council, the Shanghai Cooperation Organization. Also, practicingan active cultural diplomacy, spreading knowledge about the Chinese civilization and its values can be regarded (from the view point of soft power) as an implementation of the “Peaceful Rise” (Zhongguo heiping jueqi) or “Peaceful Assertion of China”, concept deep-rooted in the Chinese military strategy and philosophy (being mentioned in Sun Zi’s Art of War, a 2500-old text, as the «buzhan ersheng» strategy, «the art of winning without fighting»), connected to the political theory of the «window of opportunity» open for China in the contemporary international relations. The complex concept of «Peaceful Assertion/Rising of China» includes more and more the proactive cultural component (foundation of Confucius institutes, of centres teaching Chinese, familiarization of partners of Chinese corporations with the cultural values of China, intensification of relations of cultural cooperation with other countries, active support given to Chinese communities in other countries, to promote the originality of the Chinese civilization, in the societies of the host-countries, celebrating a year of Chinese culture in other countries), component which is assumed officially. The traditional cultural conception based on the spiritual values granted by Taoism and Confucianism is visible in the content of NSC (New Security Concept), which, according to certain authors, is based on a tri-dimensional approach to security (comprehensive security, cooperative security, common security), as well as on values such as mutual respect, mutual benefit, equality and cooperation among people. This approach fundamentally opposes the idea of zero sum game, military hegemony and the concept of power policy; on the contrary, its intention is to create a harmonious international political environment, especially for the Eastern Asian area (regarding as having a strategic importance for China). Launched for the first time in 2003, by Zheng Bitszyan, Provost of the PPC Central Party School, and introduced subsequently in several official speeches, scientific conference and doctrine papers regarding China’s external policy, the concept includes a strong dimension of peace and economic development, explaining the idea of assertion through soft power (here, regarding China’s economic assertion, as an instrument of soft power). The aspect of «economic development» was accentuated in 2004 and connected to a political strategy following the traditional Confucianism line, based on “harmony” (asserting the concept of “harmonious world”, in September 2005, concept included in the official PCC doctrine and considered to be one of the characteristics of the Hu administration). «The Peaceful Rise of China» was also connected to the concept of «harmonious diplomacy» (the objective is that China’s external partners accept that this country accumulated its political and economic power, without any intention of military conflict or expansionism, a rise based on win-win cooperation and on the idea of mutual benefit). The emphasis placed on the soft aspect of the concept of “Peaceful Rise” was shown in the RI Chinese doctrine as entailing a type of soft personality for China, one based not on the material aspect, as much as on the spiritual aspect (the idea of using resources of the intangible power, such as culture or political values). Blannin, Pat (2011) ”The New Security Concept. China’s 21st Century Security Strategy for a Multi-Polar World”, INTR 13-303 Chinese Defence Policy, February, pdf. Brzezinski, Zbigniew (2006) Triada geostrategică. Conviețuirea cu China, Europa, Rusia. Translated by Sanda-Ileana Racoviceanu. Bucharest:Historia Publishing House. Budura, Anna Eva (2008) Diplomația chineză. Chaogong, sistemul de relații ale Chinei cu lumea din afara ei, anexa 9, col. Geopolitica. Bucharest: Top Form Publishing House. Budura, Romulus Ioan (2008) Afirmarea pașnică a Chinei ca superputere mondială a sec. al XXI-lea, in Budura, Anna Eva (2008) Diplomația chineză, premise istorice și spiritual. Col.Geopolitica. Bucharest: Top Form Publishing House. Cohen, David (2014)”In a Fortnight. A Clash of Security Concepts: China’s Effort to Redefine Security”, The Jamestown Foundation, China Brief, vol. XIV, issue 11, June 4. Colás, Alejandro (2008) Empire. USA: Polity Press. Dellios, R. (1994)”Chinese Strategic Culture, Part 1: The Heritage from the Past”.Center for East-West Cultural and Economic Studies Research Paper, no.1, April, in Blannin, Pat (2011)”The New Security Concept. China’s 21st Century Security Strategy for a Multi-Polar World”, INTR 13-303 Chinese Defence Policy, February, pdf. Dellios, R. (1996)”Mandalas of Security, Culture Mandala”. The Bulletin of the Centre for East-West Cultural and Economic Studies, vol.2, issue 1, article 1, p. 18, http://epublications.bond.edu.au/cgi. Flegontova, Tatyana (2012)”Peaceful Rise of China: Greater China Strategy”, Geopolitica, year X, nr. 44-45 (1), pg. 216.Frunzeti,Teodor; Oprescu, Sebastian (2013) Lumea marilor puteri (2011-2013), col. Geopolitica, Bucharest: Top Form Publishing House.Griffiths, Martin (ed), (2005) Encyclopedia of international relations and global politics. London and NY, US: Routledge. Lanteigne, Marc (2009) ”Who Makes Chinese Foreign Policy? Strategic Thinking and the Role of the Military. Chinese Foreign Policy: An Introduction”, in Blannin, Pat (2011) ”The New Security Concept. China’s 21st Century Security Strategy for a Multi-Polar World”, INTR 13-303 Chinese Defence Policy, pdf. Lao Zi (2009) Dao De Jing (Cartea despre Dao și virtute).Translated by Su Yan.Bucharest: Ed. Herald. Rosière, Stéphane (2003) Géographie politique &Géopolitique. Une grammaire de l’espace politique.Paris: Ellipses. Sellier, Jean (2006) Atlasul popoarelor din Asia Meridională și Răsăriteană. Translated by Irina de Hillerin and Magda Stan.Bucharest: Niculescu Publishing House. Wu Baiyi (2001) ”The Chinese Security Concept and its Historical Evolution”, Journal of Contemporary China, 10:2, p. 278. Although the categorization is not entirely exact, as China can also be considered a “great power”, in other periods of its millenary history, not only at the beginning of the 21st century – as stated by a part of the RI academic literature (on China as a great power, as an imperial entity, in various periods of its history) See Jean Sellier, Atlasul popoarelor din Asia Meridională și Răsăriteană, translated by Irina de Hillerin and Magda Stan,Niculescu Publishing House, House, 2006, pp. 129-147. First introduced in 1996, at the National PCC Congress, then officially presented by President Jiang Zemin, at the General ASEAN Conference /1997 (in 1996, China became “full-fledged member” of ASEAN). See Pat Blannin, The New Security Concept. China’s 21st Century Security Strategy for a Multi-Polar World, February 2011, INTR 13-303 Chinese Defence Policy, pdf. Although another part of the doctrine (“the realists”, such as Kaplan) rejects this approach, considering that “China’s benefit would entail loss for other large powers”, seeing the economic and military rise of China as “a direct danger to the stability of the international security environment”. According to Pat Blannin, op. cit., pdf. Strategic view, with deep philosophical roots in the Chinese culture (Confucianism); for example, we quote a fragment from Xun Zi, The Path to Ideal Governing, the chapter on Honour and Shame (Rongru): “… if we consider the Path of the Kings Aforetime, the guiding principles of humanity and justice, are they not the ones helping us coexist, support each other and feed each other, correct and elevate each other, ensure peace and security?” (Xun Zi, Calea guvernării ideale, translated by Luminița Balan, Polirom, Iași, 2004, pp. 94-95). Pat Blannin, op. cit., pdf. In the White Paper of Defence/1998, Chinese strategists consider that, in the 21st century “security can no longer be guaranteed by a strengthening of the military capacities or by military alliances; instead, it should be based on mutual trust and common interests”. China should “promote dialogue-based trust, seek cooperation-based security, respect for the sovereignty of the other, solving disputes through peaceful means and make efforts to achieve common development.” White Paper, Ministry of National Defence, The People’s Republic of China, Beijing, 1998. Marc Lanteigne, Who Makes Chinese Foreign Policy? Strategic Thinking and the Role of the Military. Chinese Foreign Policy: An Introduction, 2009, quoted by Pat Blannin, op. cit., pdf. Jiang Zemin spoke for the first time about the “strategic opportunity”, in a speech addressing the Ministers of Foreign Affairs, in Geneva, 1999; afterwards the term was used in the 2002 Declaration of the PCC Congress. Zbigniew Brzezinski, Triada geostrategică. Conviețuirea cu China, Europa, Rusia, translated by Sanda-Ileana Racoviceanu, Historia Publishing House, Bucharest, 2006, p. 19. Strategic conception dating back to the beginning of the 21st century, for which we identify the Taoist philosophy as a source: “The Tao of Heaven: Does not contend and yet excels in winning (…) The heavenly net is vast/Loose, and yet does not let anything slip through (chapter 73); The Tao of heaven/Benefits and does not harm/The Tao of sages/Assists and does not contend” (chapter 81) Lao Zi, Dao De Jing (Cartea despre Dao și virtute),translated by Su Yan, Herald Publishing House, Bucharest, 2009, p. 138. In July 2000, during his visit to Indonesia, Hu Jintao referred to NCS and its Four Pillars, talking about “new security order should be established to ensure genuine mutual respect, mutual cooperation, consensus through consultation and peaceful settlement of disputes, rather than bullying, confrontation, and imposition of one’s own will upon others”. This also entails implementing the NCS in the region of South-East Asia. According to Cf. Carlyle A. Thayer, China’s New Security Concept and Southeast Asia, press.anu.edu.au/wp-content/uploads/2013/05/ch085.pdf, accessed on June 10th 2014. Pat Blannin, The New Security Concept. China’s 21st Century Security Strategy for a Multi-Polar World, February 2011, INTR 13-303 Chinese Defence Policy, pdf. NCS, regarded by the Chinese officials as a universally valid concept, applicable progressively, the same as The Five Principles of Peaceful Coexistence. It is more than a simple use of words, it is the reimplementation of the conception according to which “the purpose of the security policy should be that of maintaining an extremely peaceful international environment, in view of development”. NCS connects to the concept launched under the Xi administration, that of “overall national security”. See David Cohen, In a Fortnight. A Clash of Security Concepts: China’s Effort to Redefine Security, The Jamestown Foundation, China Brief, vol. XIV, issue 11, June 4, 2014. Another common declaration (at the meeting between China and Russia, in April 1997) can be mentioned, i.e. the moment when presidents Jiang Zemin and Boris Yeltsin specified the necessity “of a new and applicable concept of security”, which, according to a part of the RI doctrine, reveals China’s intention to maintain itself as a key-actor of the international scene, as “a responsible global power, ready to play a leadership role”. According to David Lampton (Introduction, The Three Faces of Chinese Power, University of California Press, US, 2008). Also see Anil Kumar, quoted op., www.ipcs.org. Anil Kumar, op. cit., www.ipcs.org. Martin Griffiths, ed., quoted op., pp. 398-399, 579-580. Wu Baiyi, The Chinese Security Concept and its Historical Evolution, Journal of Contemporary China, 2001, 10:2, p. 278. Pat Blannin, The New Security Concept. China’s 21 st Century Security Strategy for a Multi-polar World, February 2011, INTR 13-303 Chinese Defence Policy, pdf. R. Dellios, Mandalas of Security, Culture Mandala; The Bulletin of the Centre for East-West Cultural and Economic Studies, vol.2, issue 1, article 1, pg. 18, 1996, http://epublications.bond.edu.au/cgi. R. Dellios, Chinese Strategic Culture, Part 1: The Heritage from the Past, Center for East-West Cultural and Economic Studies Research Paper, no.1, April 1994, citat de Pat Blannin, quoted op., pdf. R. Dellios, Mandalas of Security, Culture Mandala; The Bulletin of the Centre for East-West Cultural and Economic Studies, vol.2, issue 1, article 1, pg. 18, 1996, http://epublications.bond.edu.au/cgi. R. Dellios, Chinese Strategic Culture, Part 1: The Heritage from the Past, Center for East-West Cultural and Economic Studies Research Paper, no.1, April 1994, quoted by Pat Blannin, quoted op., pdf. The concept of “Peaceful Rise” was subsequently translated, depending on China’s level of “economic assertion”, as “Peaceful development” (as a form of reassuring the international community and especially China’s neighbours, regarding its peaceful intentions in the future). Anna Eva Budura, Diplomația chineză. Chaogong, sistemul de relații ale Chinei cu lumea din afara ei, Annex 9, col. Geopolitica, Top FormPublishing House, Bucharest, 2008, pp. 216-217. Stéphane Rosière, Géographie politique &Géopolitique. Une grammaire de l’espace politique, Ellipses, Paris, 2003, pp. 291-292. Anna Eva Budura, Diplomația chineză. Chaogong, sistemul de relații ale Chinei cu lumea din afara ei, op.cit., pp. 216-217. Alejandro Colás, Empire, Polity Press, USA, 2008, pp. 116-117. Anna Eva Budura, op. cit., pp. 216- 217. Anna Eva Budura, Diplomația chineză. Chaogong, sistemul de relații ale Chinei cu lumea din afara ei, pp. 216-218. For example, the period of China’s opening towards commerce with the Occident (1839-1901). See Jean Sellier, op. cit., pp. 147-152. Anna Eva Budura, op. cit., p. 216. Anna Eva Budura, Spiritualitatea chineză, in Diplomația chineză, quoted op.,pp. 147-148. Teodor Frunzeti, Sebastian Oprescu, Lumea marilor puteri (2011-2013), col. Geopolitica, Top Form Publishing House, Bucharest, 2013, p. 172. Values based on respect for the ancestors, respect for the scholars, cultivating reason and high virtues, cultivating systems organized on the basis of meritocracy, governing by the example of rulers’ virtues, respecting the human being and his/her rights, peaceful and respectful contacts with other cultures and civilizations, harmonious society, peaceful coexistence with other civilizations etc. According to Romulus IoanBudura, quoted op., p. 298. In Sun Zi’s view, war can be lost or won even before the hostilities actually begin, as victory can be obtained through strategy and preparations, demoralizing and weakening the adversary, through strengthening own forces. See Romulus Ioan Budura, Afirmarea pașnică a Chinei ca superputere mondială a sec. al XXI-lea, in Anna Eva Budura, Diplomația chineză, premise istorice și spirituale, quoted op., p. 288. Tatyana Flegontova, Peaceful Rise of China: Greater China Strategy, Geopolitica, year X, no. 44-45 (1/2012), p. 215. Idem, p. 216, quoting Joseph Hiring, in J.S. Nye, Soft Power: The Means to Success in World Politics, NY, Public Affairs, 2004.